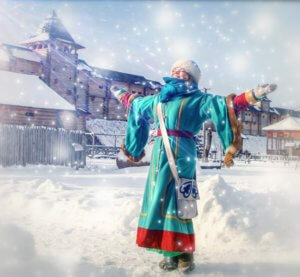 On December, 15-16 a show-program “The New Year`s fairytale” will take place in the «Kyivan Rus Park». The great opening of the New Year`s Residence, the premiere of the interactive show for children and adults, horse riding and ancient Slavic amusements will be waiting for the guests of Ancient Kyiv. On December, 19, on the St. Nicolas day, Ancient Kyiv inhabitants invite children and adults to meet this Saint that is so kind and beloved by all. The ticket price: a full adult ticket – 150.00 UAH, for pensioners and students – 100.00 UAH; for schoolchildren – 50.00 UAH, for preschool children – for free. 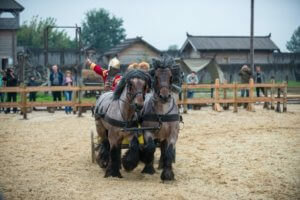 An interesting and cognitive program with horse-trick performances, live vocal, theatrical performances on historic theme, ancient Slavic amusements will be waiting for the guests. Also the guests will be presented a historical horse breeds collection from all over the world in the Princely stable. Ancient Kyiv opens at 10:00. The program starts at 13:00 and will last till 18:00. The ticket price: a full ticket for an adult – 150 UAH., for pensioners and students – 100 UAH., for schoolchildren – 50 UAH., preschool children – for free. Ancient Kyiv in the Principality of «Kyivan Rus» is not far from the modern Kyiv – only in a 45-minutes drive – in the Kyivan region, Obukhivskiy district, vill. Kopachiv. Route taxis from Kyiv leave from the «Vydubychi» metro station (the exit from the metro to the side of the «Fourchette» supermarket), according to the schedule on the website. – at the cash desk at the entrance to the «Kyivan Rus Park».